Over the past few years, I have started becoming thankful for the little things in life more than I used to, but reading Ann Voskamp‘s “One Thousand Gifts” helped me realize the necessity of being thankful for everything. 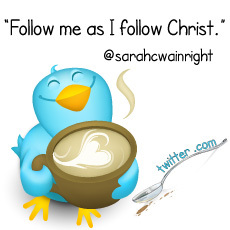 Want to be in God’s will? Give thanks. As corny as it may sound, gratitude really does change your attitude. I’m learning by experience that one way to make Jesus bigger in your eyes is to list the many grace-gifts He gives you each day. Everything from a gem of truth He reveals to you as you read His Word, to the beauty of His glory seen in His creation. Like the old hymn states, “Count your many blessings, name them one by one, and it will surprise you what the Lord has done.” I’ve started keeping a journal to list such gifts and it’s amazing how much He blesses me day by day in ways I never noticed before. 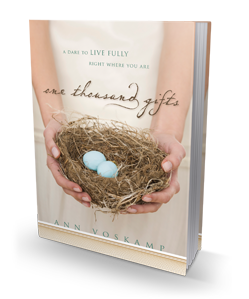 Ann Voskamp often uses the phrase, “All is grace.” How very true. Everything He gives, everything He withholds. It’s ALL grace, being worked together for my good! In reality, I’m a sinner who deserves the wrath of God, but because of GRACE, my sins have been covered by Christ’s precious blood. So, frankly, anything outside of hell is grace. What lavish grace He has shown! Doesn’t that make Jesus more beautiful in your eyes? I had heard sooooo many good reviews about this book and am so glad I finally took the time to read it. It literally is a book that you cannot put down. Ann is a very gifted writer who carefully chooses every word. You NEED to read it. I promise you once you do, the book will be near the top of your 1,000 gifts list…guaranteed.